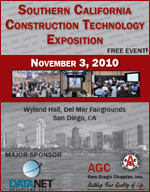 PipelineSuite® will be an exhibitor at the 2010 AGC Southern California Construction Technology Exposition in San Diego November 3. All General Contractors that visit our booth will receive a PipelineSuite T-shirt and be able to test-drive pipelineRFQ™ bid invitation software and its integrated pipelineOPR™ online plan room. PipelineSuite is a popular web-based pre-construction bid management software solution for mid-sized general contractors, allowing users to perform pre-construction functions in a fraction of the time it used to take. General contractors that are looking for a replacement for BidFax ® or Bid Fax ® Pro software can be up and running in pipelineRFQ™ within 24 hours.